Carsten Höller kicks inhibitions to the curb at the Hayward Gallery: dive in for the most fun you'll have all summer! The Hayward Gallery Carsten Höller exhibition is like nothing you've ever experienced. A riot from start to finish, this is part fairground, part hard-core art intervention. "Of course this is a playground!" Höller laughs, "that's one of the only decisions that you don't have to make". In an exhibition built around the visitor making key decisions to affect their experience, the Belgium-born artist once again breaks down the stuffy rules and invites laughter back into the gallery. "It's so bizarre to pretend that you are seeing an exhibition without other people", Höller muses. "This show doesn't pretend there aren't other people around". Far from it. We aren't just visitors: we are totally in on the joke and become raucous trouble-makers. Funfair or serious art show? From robot beds careering around the gallery to giant slides hurtling visitors back down to ground level, it's hard not to laugh when you're inside this Carsten Höller exhibition. And who's to say that art can't be like a fairground? Sticklers for tradition and the reverent gallery experience will probably not classify this as art. It's a fantastic choice by the Hayward, ahead of a two year long closure, to go out with such a big bang - even if it is a little bit gimmicky. But Höller wants to entertain: "it's not about whether art should entertain, it's more what kind of entertainment it should be. Entertainment shouldn't just be given away to the enemy (the entertainment industry)" So we are ready to dance to Höller's tune and throw ourselves into this immersive show. A cross between Alice in Wonderland and the Matrix, this new exhibition kicks inhibitions to the curb. Choose your poison and dive headfirst into one of two dark tunnels that weave their way into the Hayward's volumetric concrete body. Tumbling through the darkness, Höller carefully stops the instinctive judgements we all make when we enter an exhibition and puts the snap decision on hold. Blink and you'll find enormous psychedelic Flying Mushrooms (2015) circling the gallery alongside a mischievous pile of red and white pills for those daring enough to take a sip and swallow. We've fallen down the rabbit hole, we've chosen the red pill and tripped into the Matrix. Crawl head-first into one of Höller's huge black and white dice, or soar above Waterloo Bridge on Two Flying Machines (2015). You can even indulge in Höller's earlier works like Upside Down Goggles (1994-2009) where you'll see visitors tottering nervously on the Hayward roof, or The Pinocchio Effect (1994) where vibrations alter the perception of our own noses. But the main draw is definitely those fantastic Carsten Höller slides, which caused such a stir in the Tate Modern Turbine Hall back in 2006/07. In 1996, the Carsten Höller Gluck exhibition at the Kölnischer Kunstverein in Cologne caused such hysteria between two groups of school children that in a frenzy they actually destroyed the show. 'I thought it was amazing!' Höller remembers. 'Not this time...' Hayward Gallery Director Ralph Rugoff nervously adds. Höller is focused on the details and this show has been carefully designed according to the visitor's experience. Perhaps that's the flaw with this ambitious exhibition: it's so commercial that it will self-destruct. Just think back to the furore surrounding the tremendous Psycho Buildings show back in 2008. 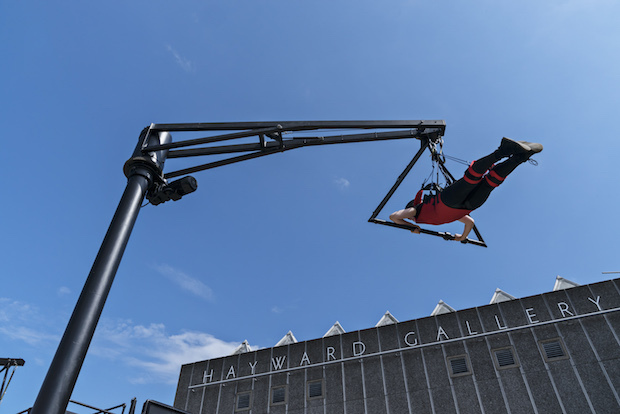 Carsten Höller Hayward Gallery tickets are going to be even harder to come by and the queues for some of the most immersive installations unbearably long. Höller is a rebel that never conforms to what we think art should be and revels in injecting his own special mischief into each installation. You'll certainly have the rug pulled out from underneath you at this show. But dive into the Hayward Gallery slides because this is the most fun you'll have all summer and perfect for playful youngsters and big kids that refuse to grow up (you know who you are).